"Do you know the story of the granny spy? " In the history of espionage, many may have missed the intriguing story of Melita Norwood who was given the title of 'granny spy.’ At the age of 84, the British senior citizen was exposed as one of the leading intelligence agents for the Soviet Union during the 1940s in the race for development of nuclear weapons by leaking documents from the British military. Even though her family lived a quiet life in a London suburb for the majority of their lives, her past was exposed by the defection of a leading KGB agent. 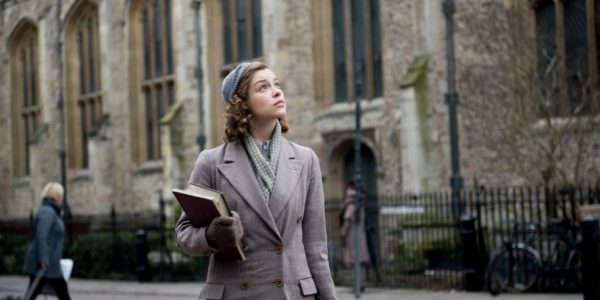 Red Joan is the story that is based on her exploits and how she was the catalyst for the Russians to remain in the nuclear arms race. The names and various accounts from Norwood’s story were changed for the sake of the book and film, but most of the key elements remain faithful to her work as a spy. In this account, her name is changed to Joan Stanley (Judi Dench) whose quiet life in a small English village is abruptly changed when MI5 agents kick on her door. As she is interrogated at the agency’s headquarters, each file brings back a flood of memories. As the agents ask her role in the Russian spy ring, Joan's past begins to become apparent to the MI5 and to her son, Nick (Ben Miles), who must work through his sense of personal betrayal despite being her legal counsel. What stands out about Lindsay Shapero’s screenplay is how the world of espionage is more a world of grays than an example of absolutes. By focusing on the impact of one woman's role in the race for nuclear armament, becomes a fascinating character study. While the script exposes the intricate nature of the recruit grooming process and the manipulative quality of this undercover work. The writer also indicates that despite the intelligence level of the individual, anyone can potentially be swayed by emotion and relationships to betray their personal sensibilities.